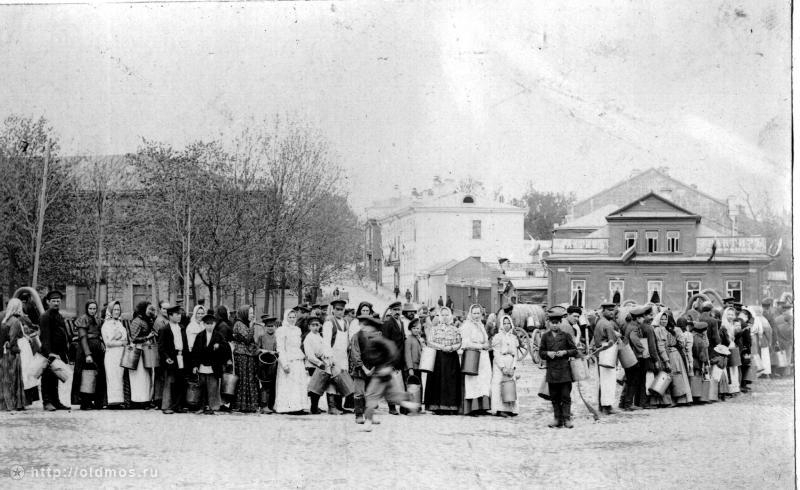 A line for water, 1890. 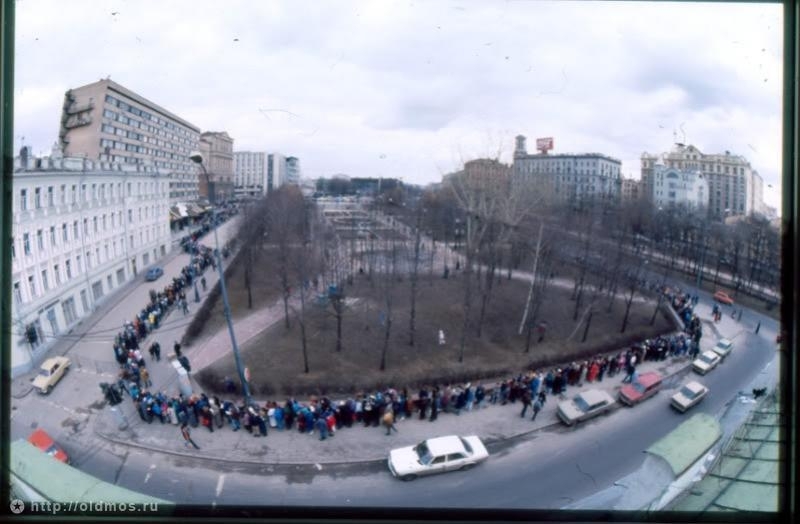 You can study history by what people would stand in lines in Moscow for. Most photographs picturing those lines were taken by tourists. 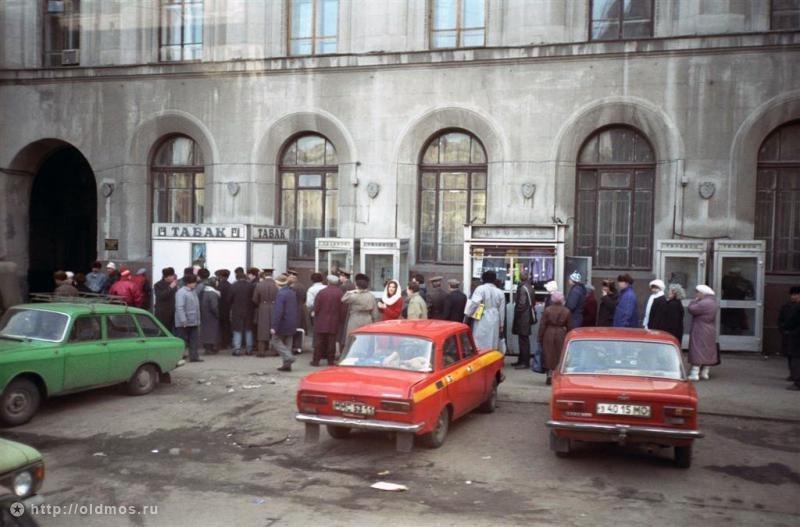 In the 30s, it was lines into cafeterias and the Mausoleum; the 80s were marked by lines for clothes; in the 90s people would wait in lines to McDonalds; and in 1998 it was banks and exchange offices which were in high demand. 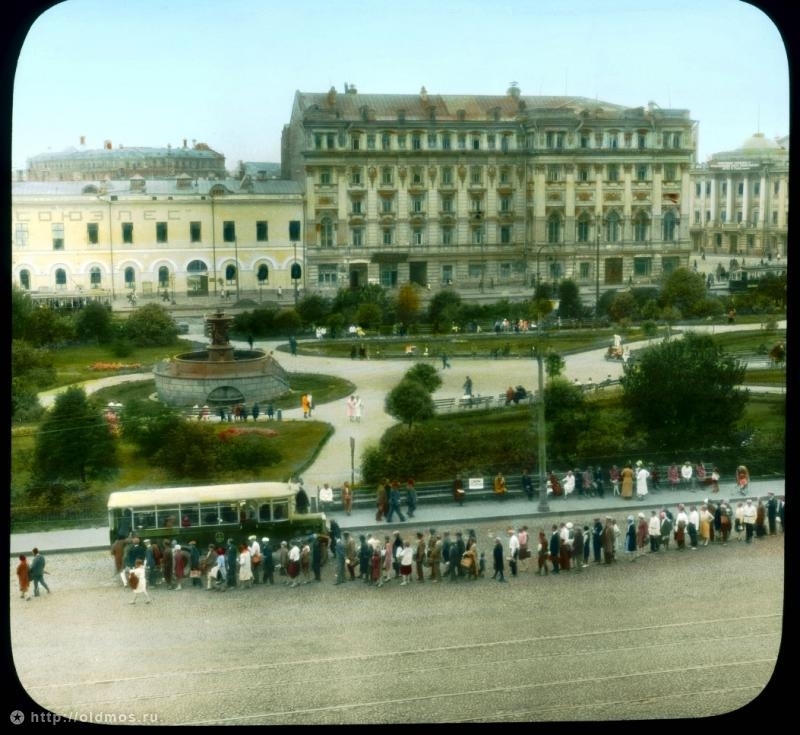 It’s good to know that today people stand in lines to get into a museum or airport. 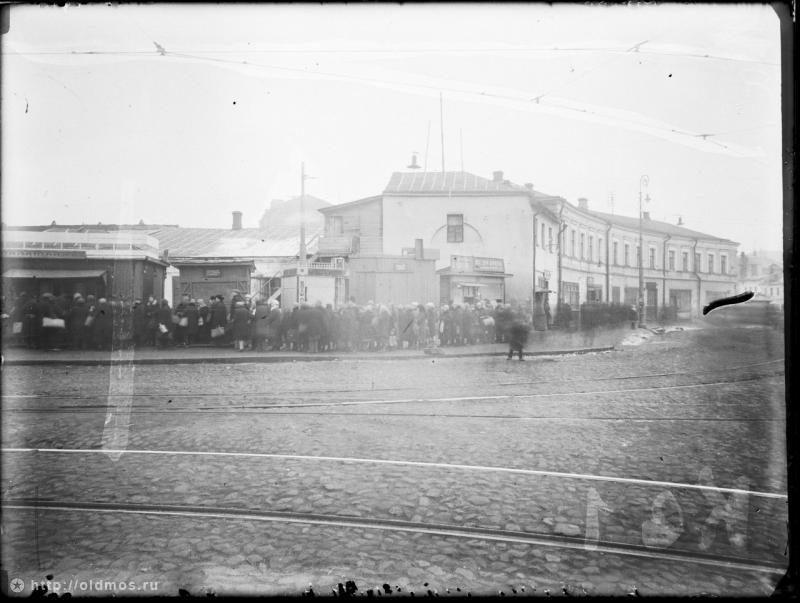 A line to the Committee of Public Catering, 1918. 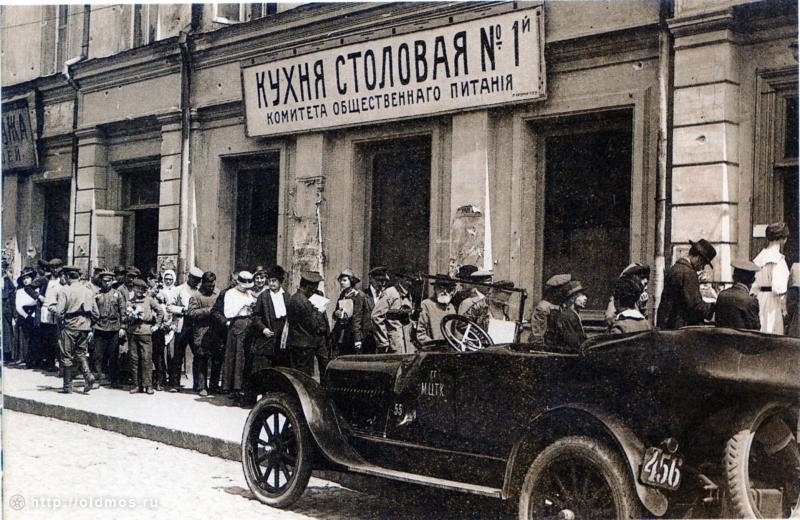 The menu of Cafeteria #1 included cabbage soup or fish soup, brown bread, carrots and onion salad, boiled pearl barley, fried herrings, stewed cabbage, boiled potatoes, etc. 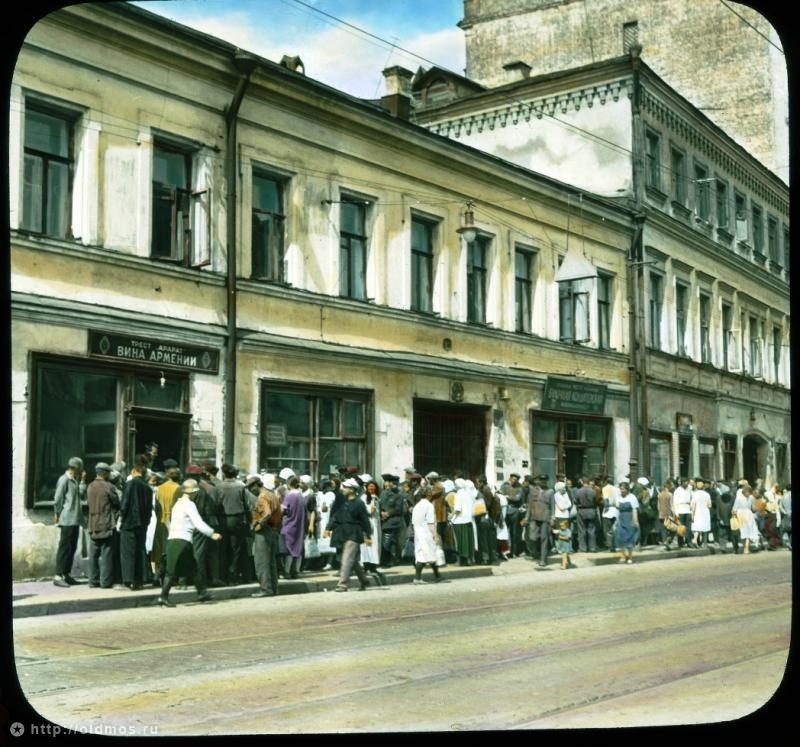 A line for food, 1929. 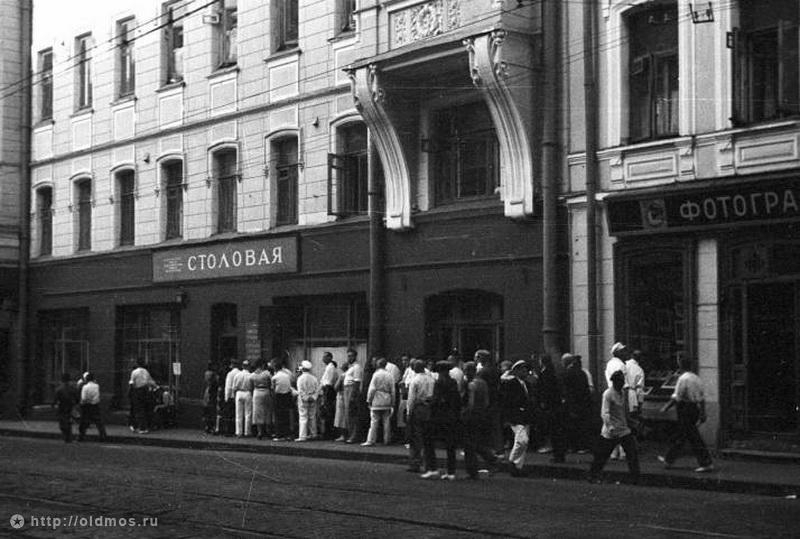 A line for wine, 1930. 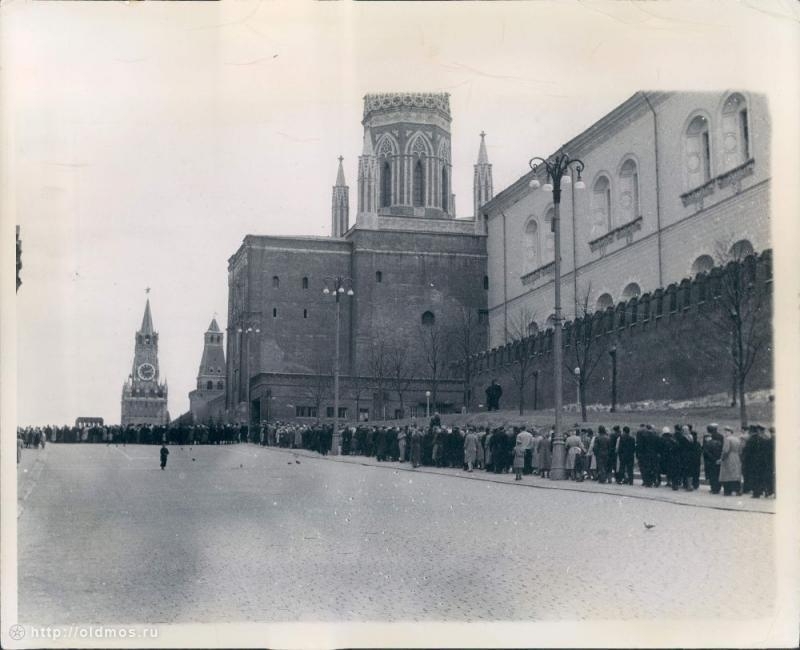 A line into the Mausoleum, 1932. 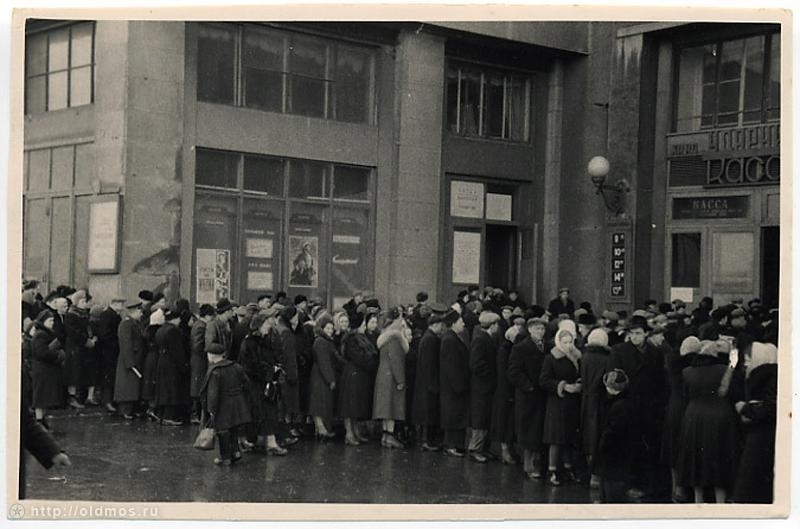 A line for food, 1935. 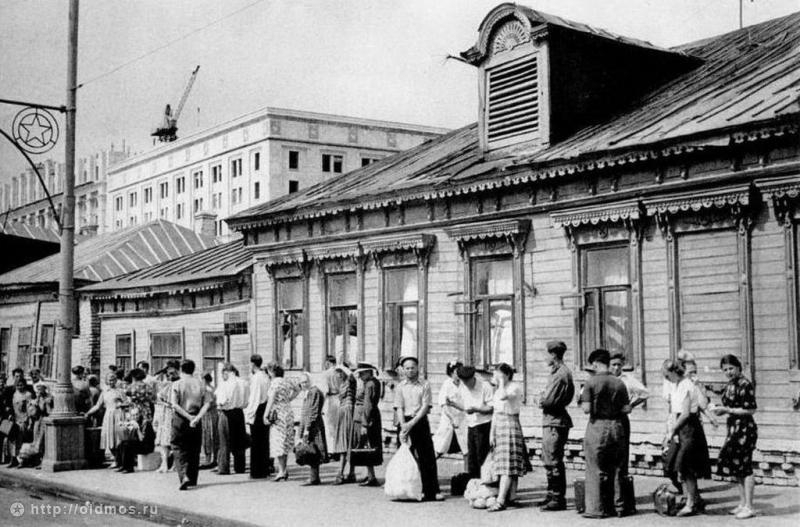 A line into a cafeteria, 1939. 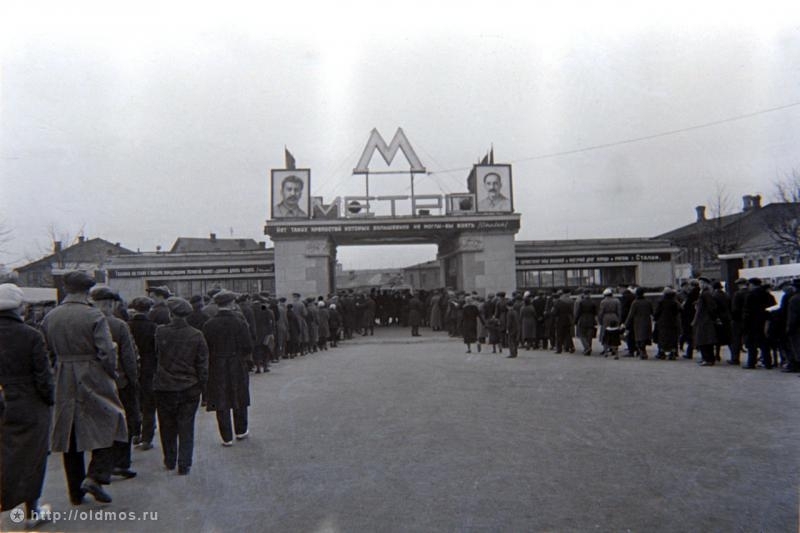 All these people are waiting for a bus, 1954. 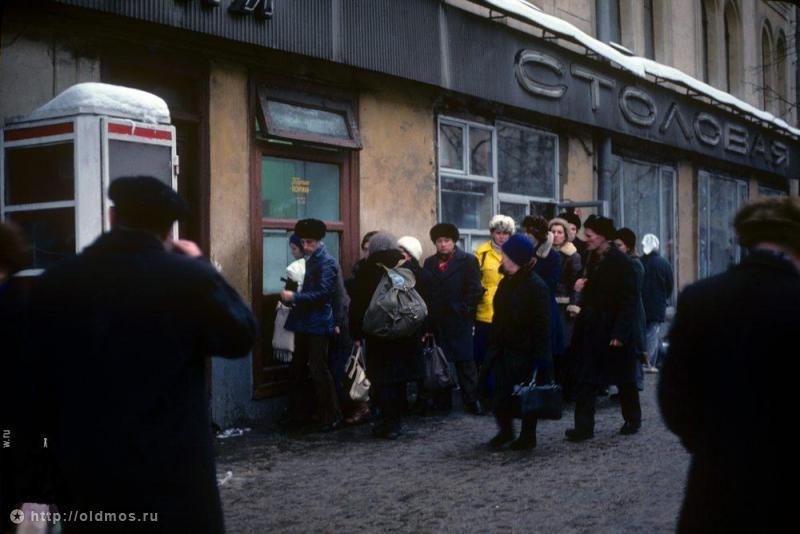 Often it so happened that people after spending a few hours in GUM would return home with nothing because clothes would get sold out really fast. 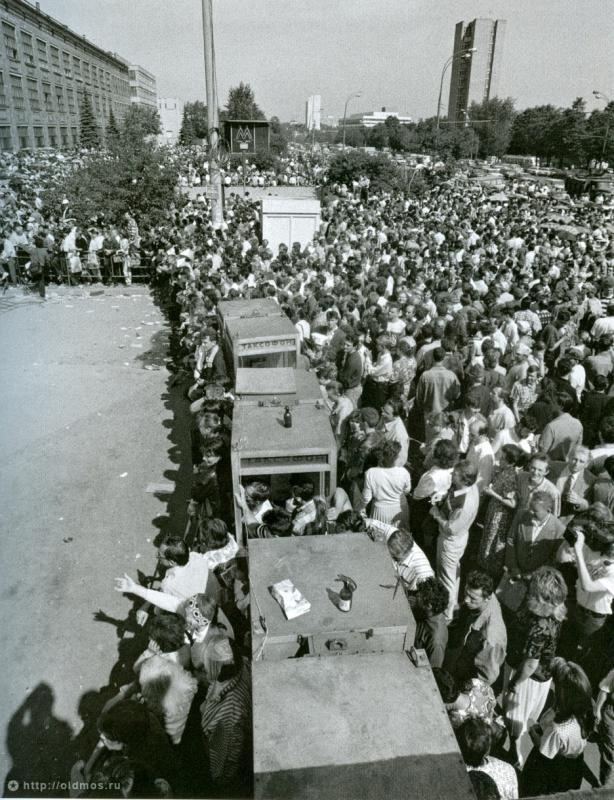 A line for hot doughnuts, 1975. 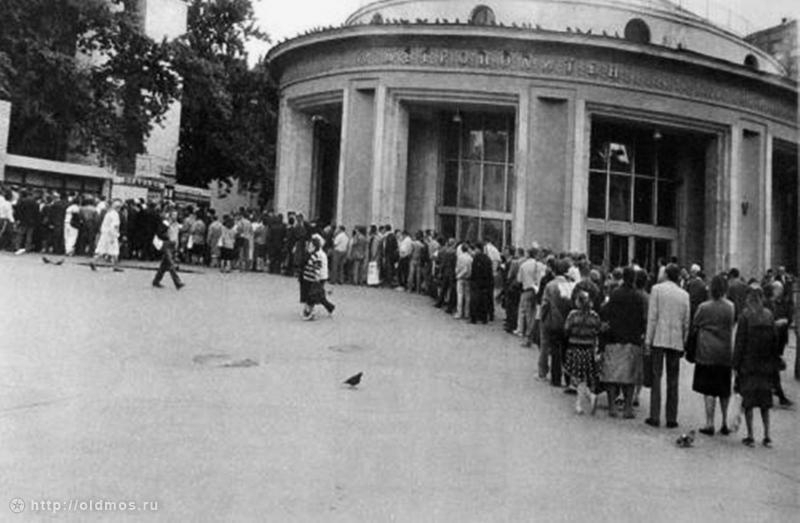 A line into the Museum named after A. Pushkin, 1979. 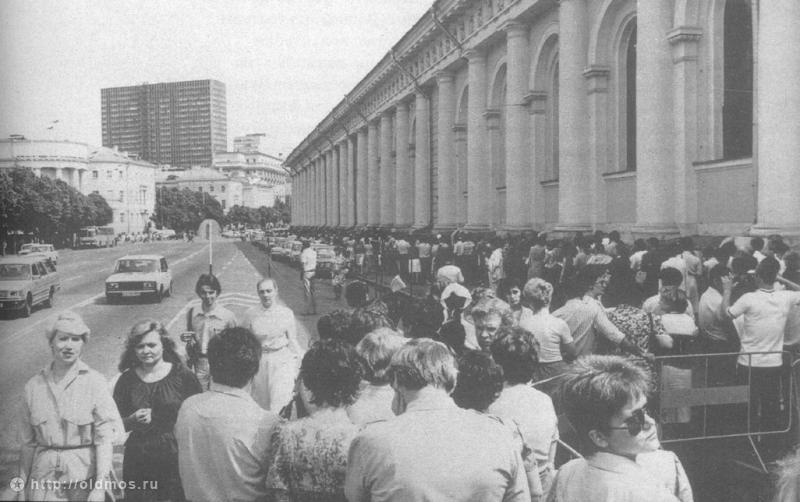 A line to Glazunov’s exhibition, 1986. 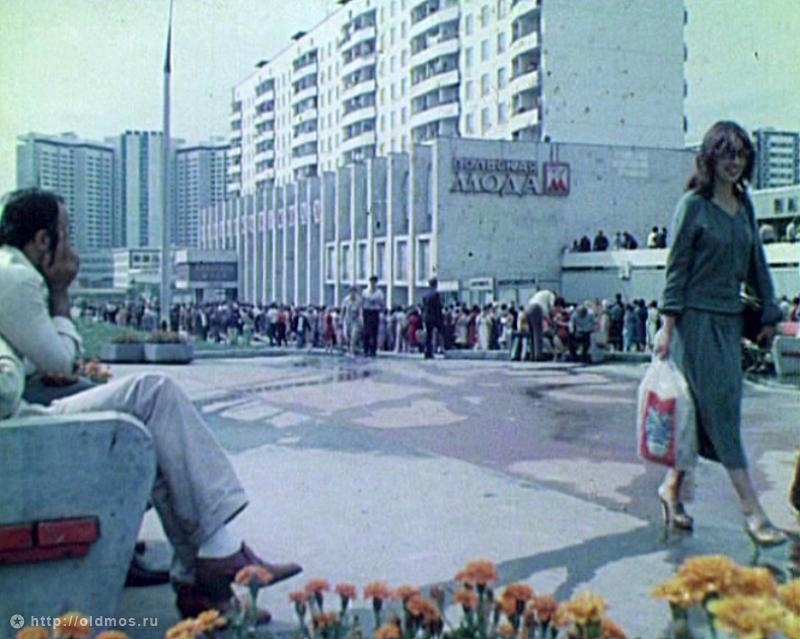 20 Moscow Artists exhibition, 1985. 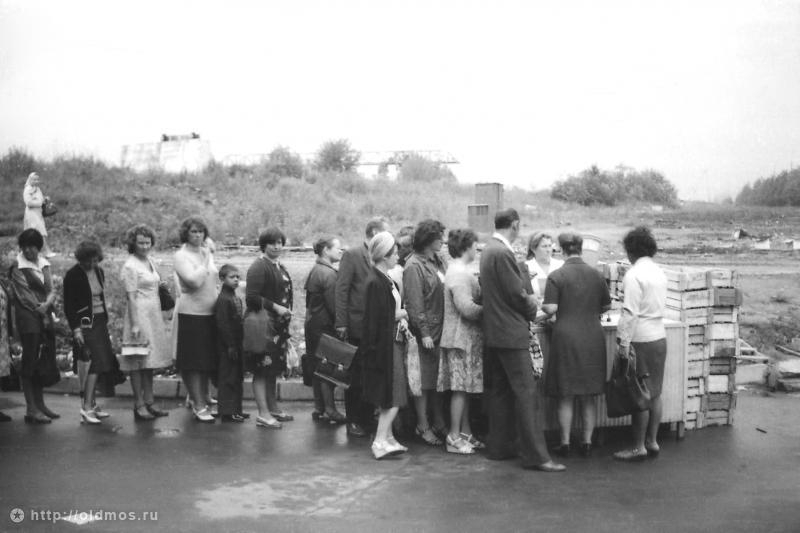 A line for cucumbers, 1979. 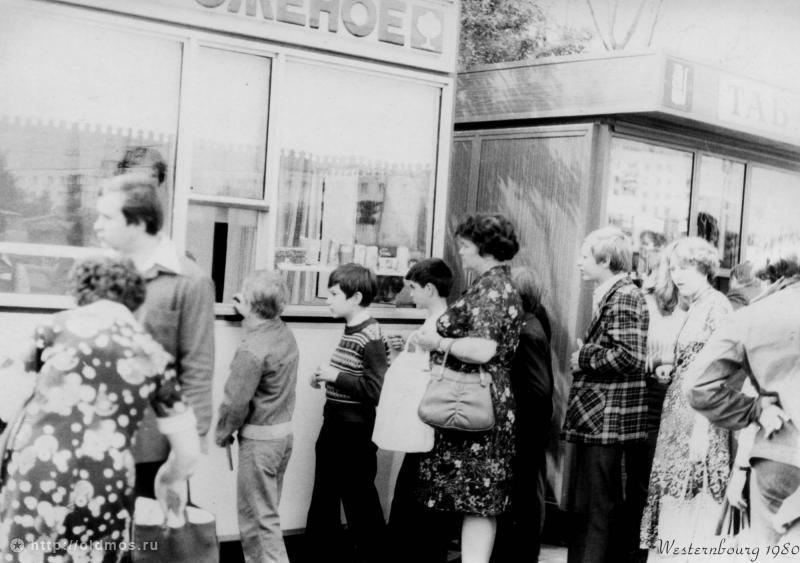 A line for ice cream, 1980. Polskaya Moda Department Store (meaning Polish Fashion). 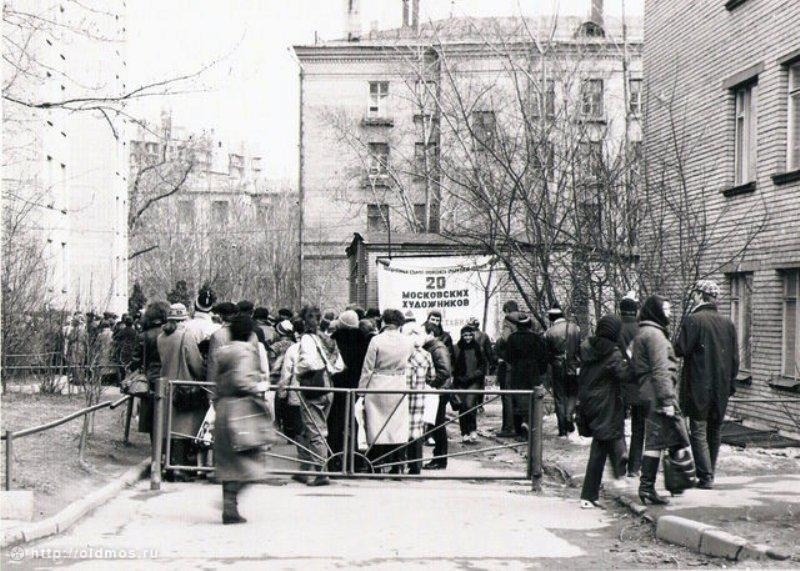 A line for shoes, 1983. 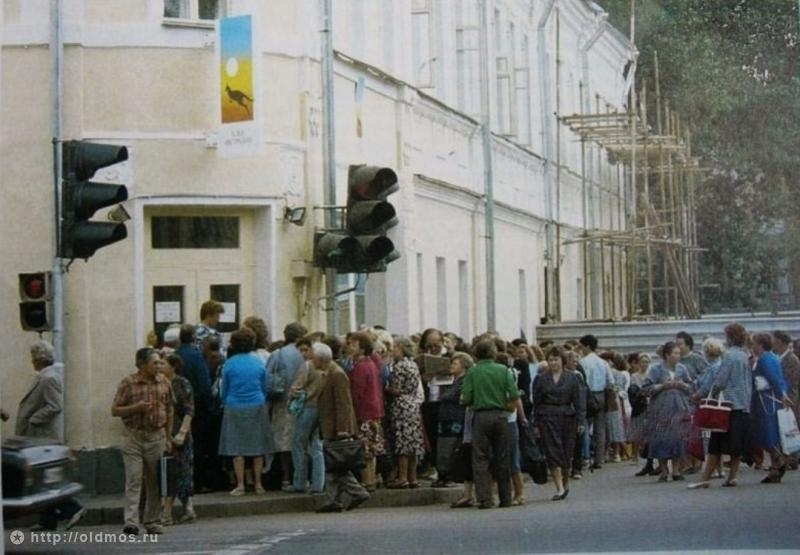 A line for cakes, 1986. 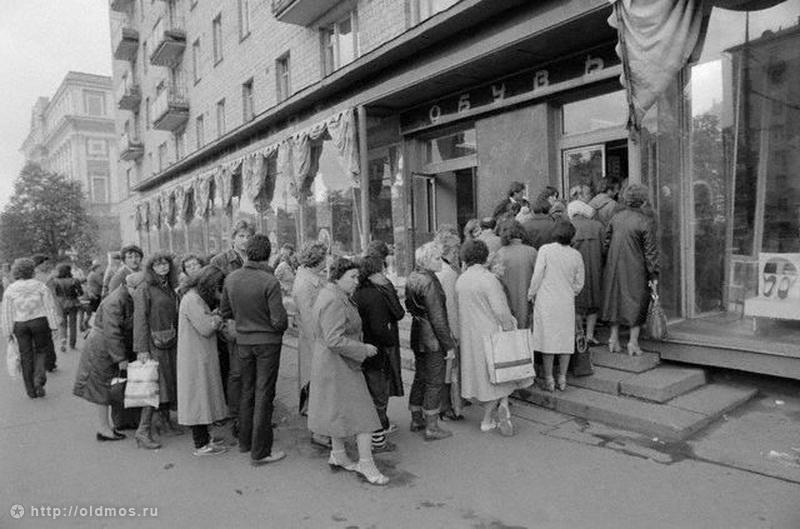 In the 80s, stores selling wine opened at 2 p.m. but people would gather in lines since early morning. 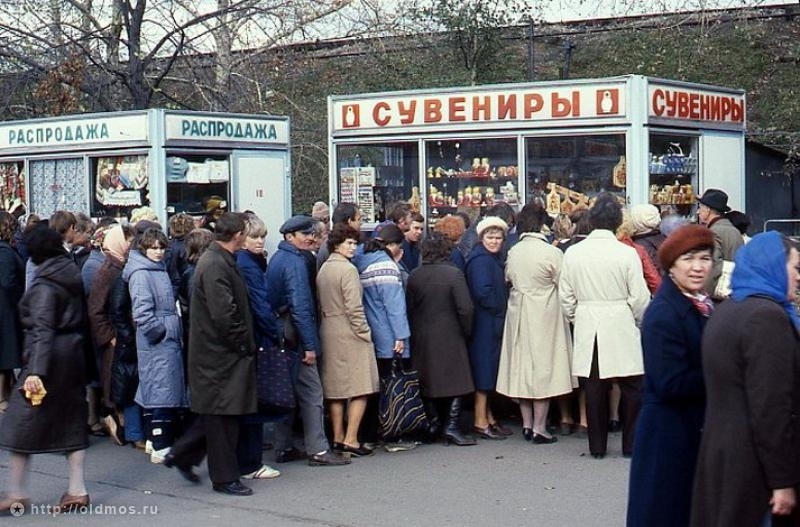 A line for soap, 1989. 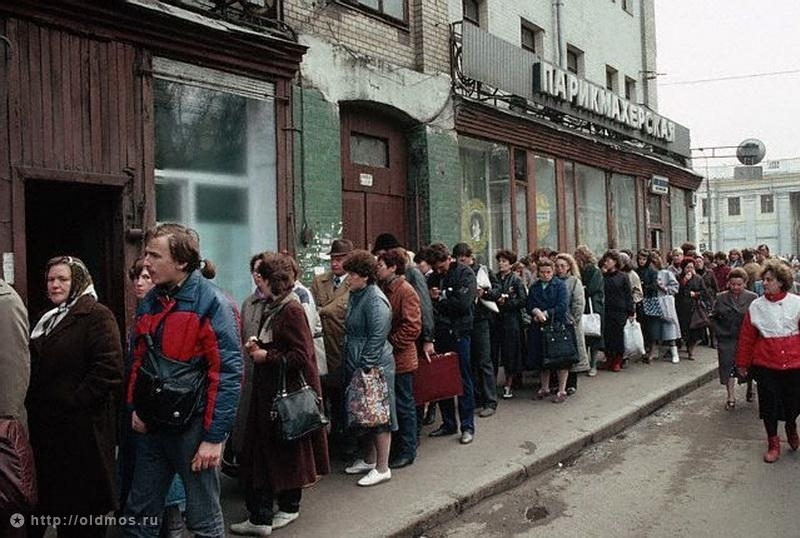 A line for cigarettes, 1990. 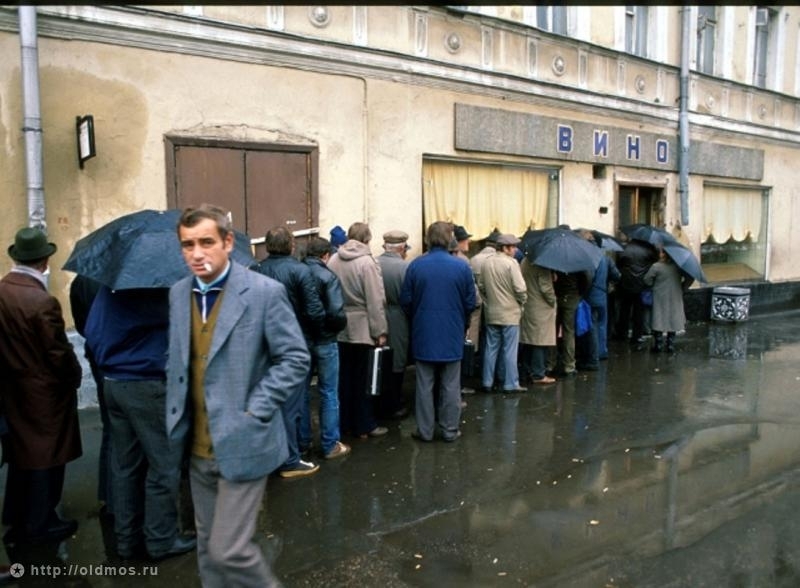 Another line for cigarettes. 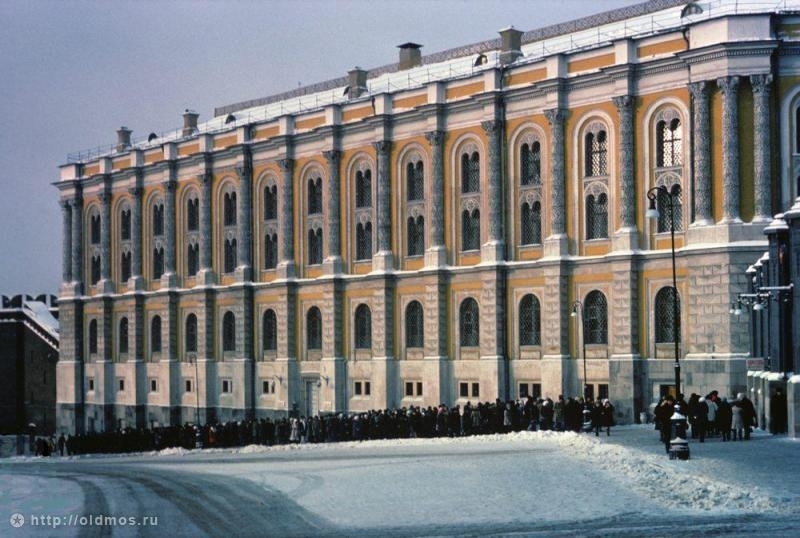 The photograph was taken in the 90s. 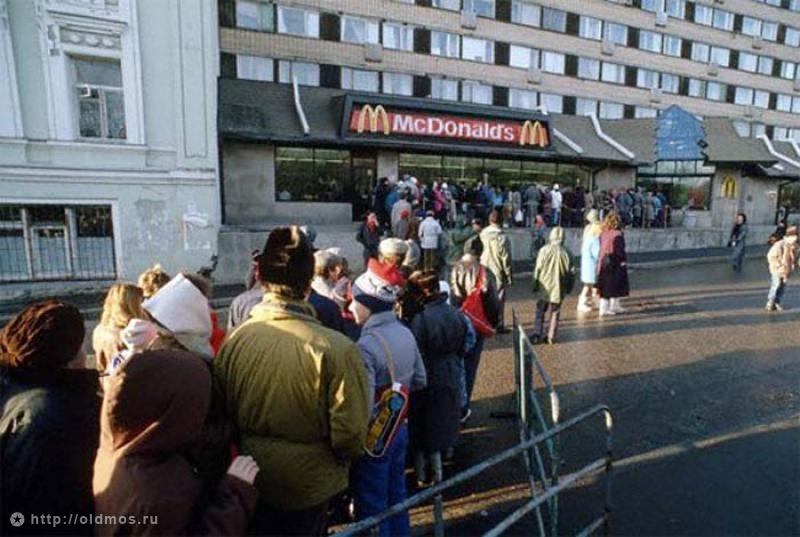 People were really excited to visit the first McDonalds opened in Moscow in 1990. 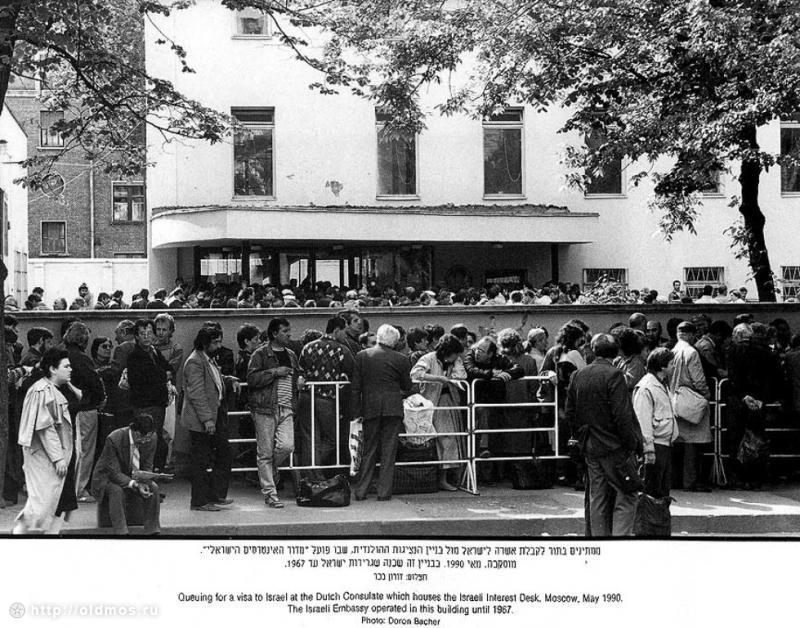 These people wanted to get a visa to Israel. 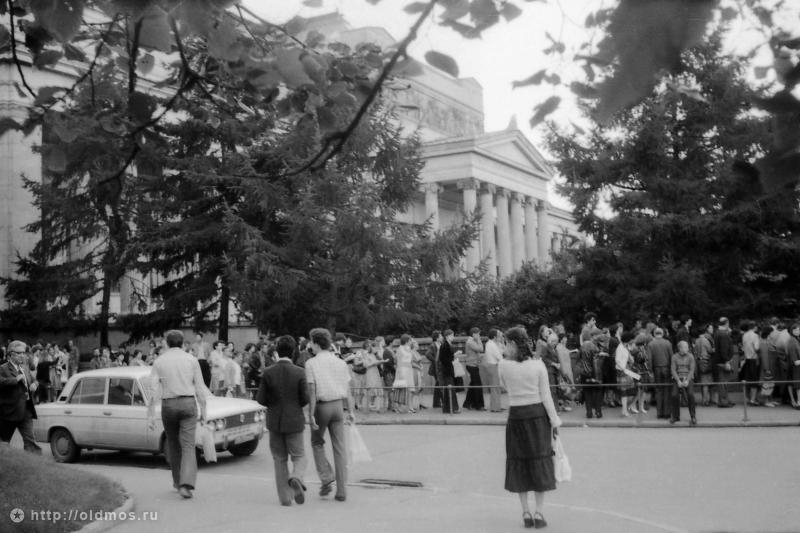 May, 1990. 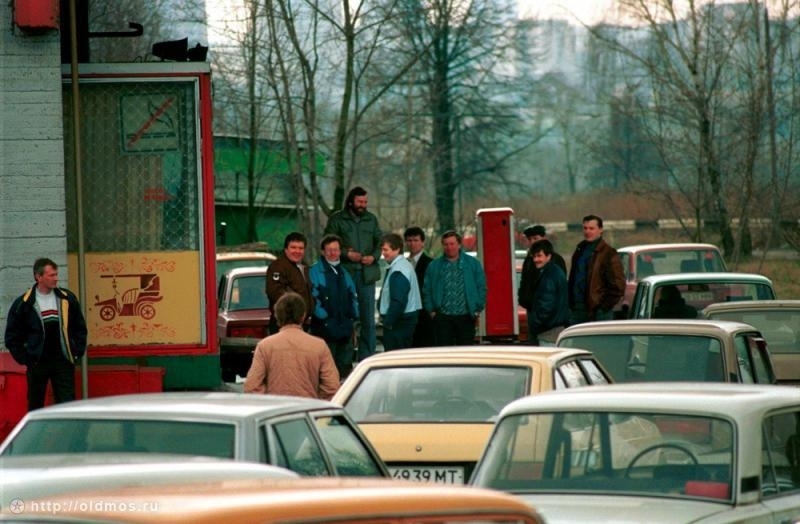 At a gas station, 1992. By the MMM headquarters (MMM was a Russian company that perpetrated one of the world’s largest Ponzi schemes of all time). 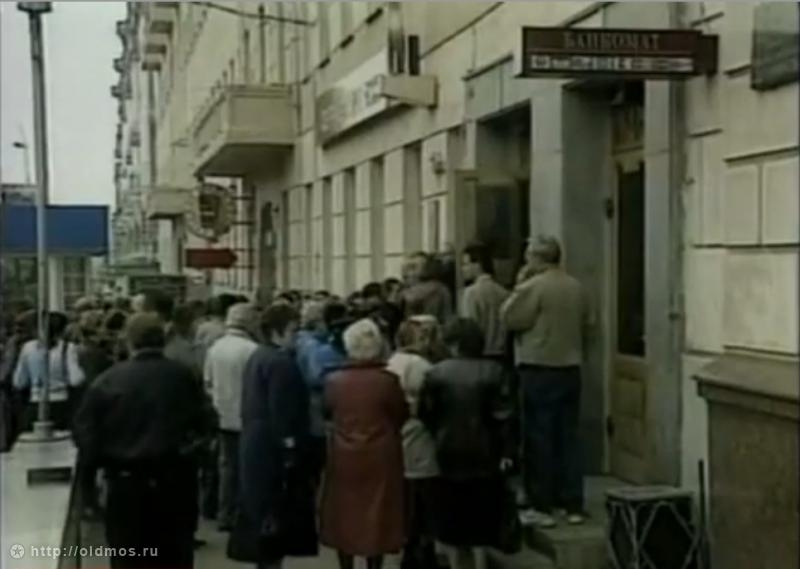 A line to a bank, 1998. 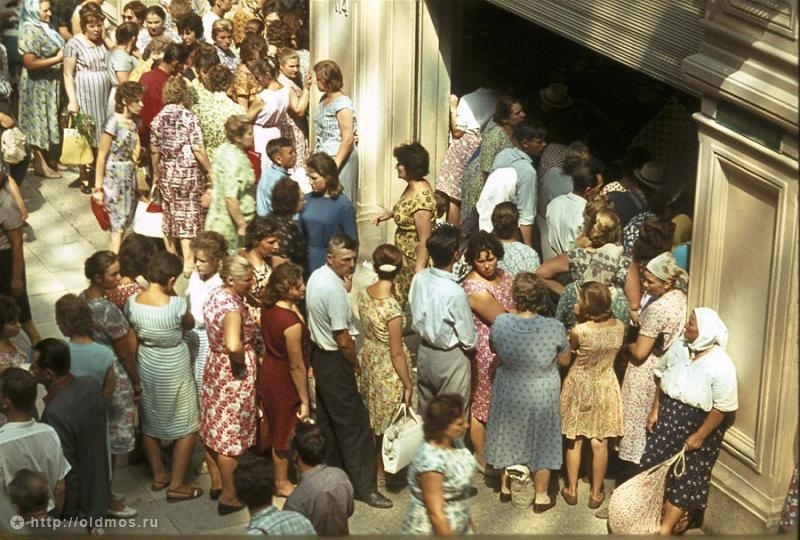 Anyone know what the sign with a kangaroo on it was about in the “A line for bread” photo? 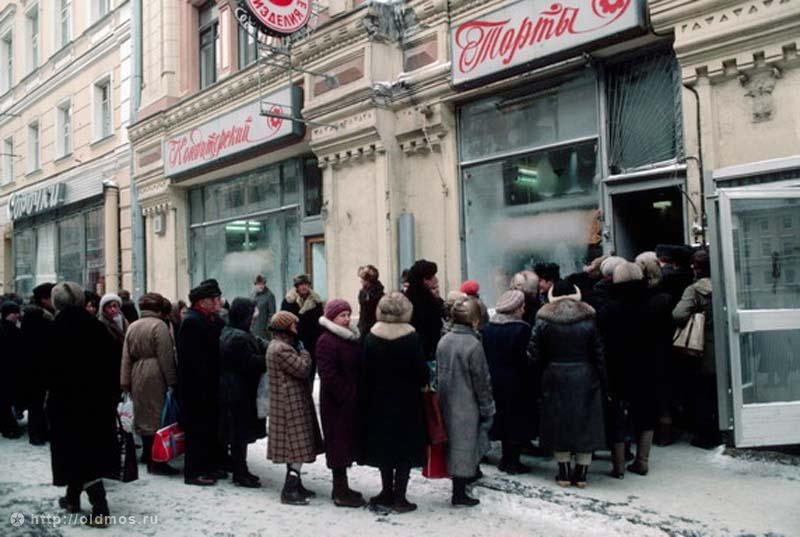 Better than the unemployment line (under capitalism). Capitalism has proven itself far superior to Communism. 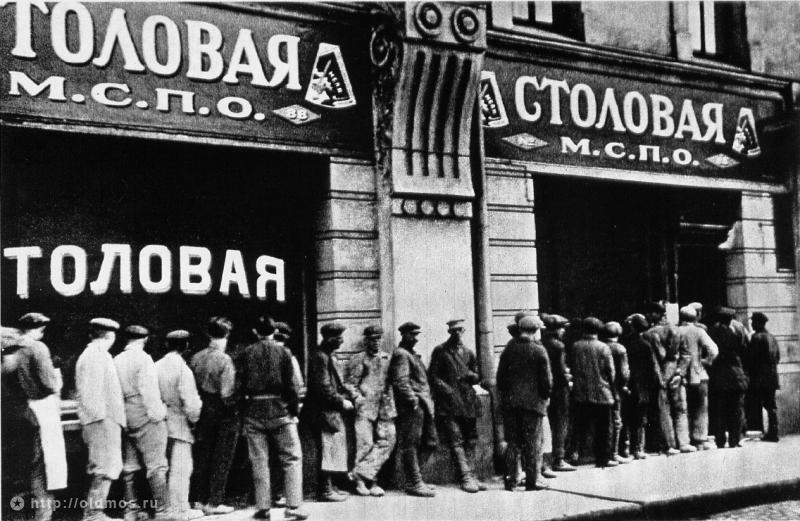 The only time Capitalism fails is when it is infected with Communism, then unemployment occurs. I thought you knew this? 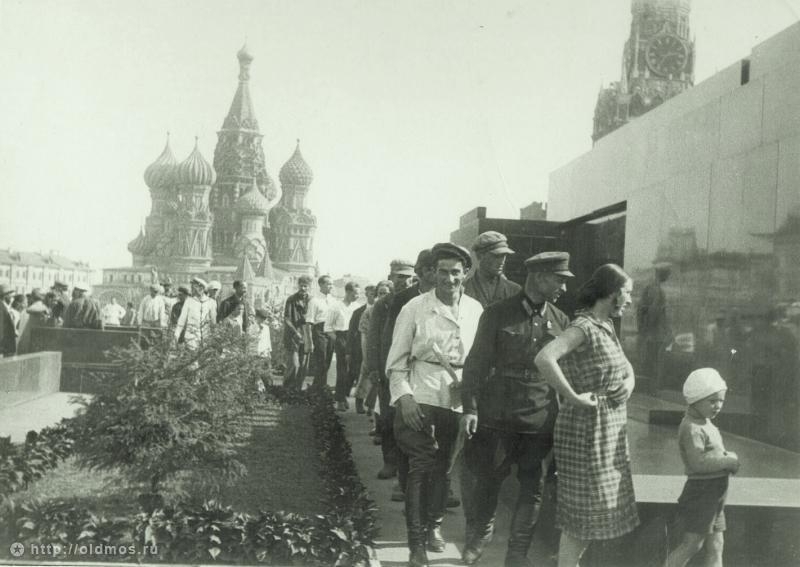 Even KGB subverter knows Marxist/Communist ideology has built-in self destruct mechanism. It has no loyalty to the system and does not want feedback from people to make it better. Great example of the FAILED COMMUNIST regime where one could not even afford toilet paper. 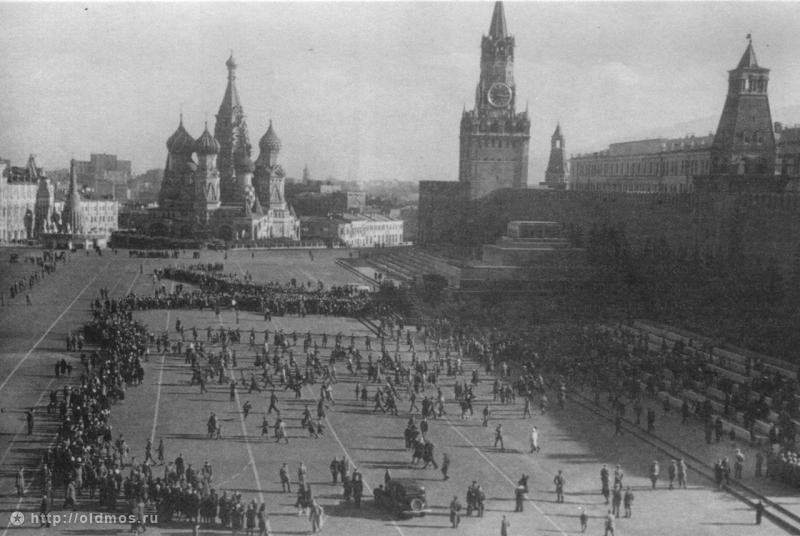 The entire USSR is still 50 years behind the Western European Countries and the United States. Obama would fit in well in a Communist country. Considering the fact that the USSR hasn’t existed for the last 20 years, I can definitely conclude that Germany is atleast 20 years behind the rest of the world. BODY ODOR one could not be in line for very long I think goats may have better aroma. 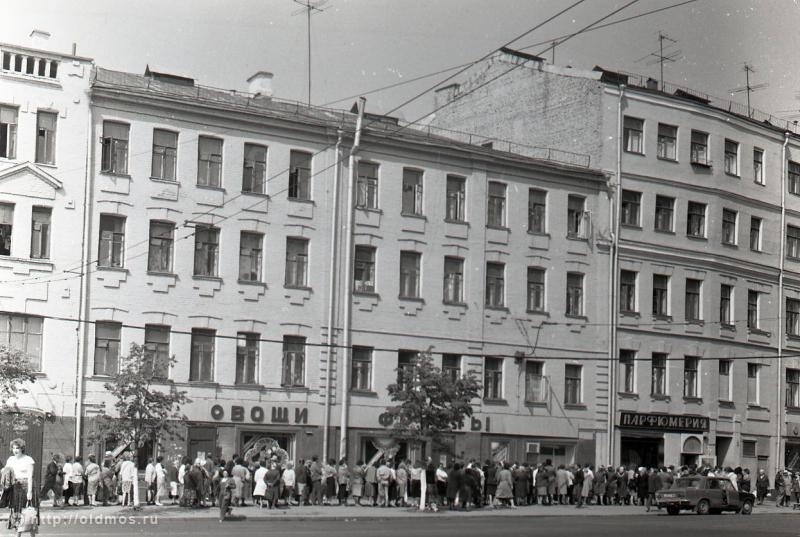 They felt full and happy….best dinner in all of Moscow at that time….for that price.